Two female scientists, one at the beginning of her career, the other at the end, met to talk about old prejudices, small victories, and the crucial question: How can I carve my own path? A discussion with Brigitte Wittmann (83) and Eva Rosenbaum (32). Ms Wittmann, you were enrolled at the university of Gießen in 1950. Was it difficult, as a woman, to get a place at university? Wittmann You bet! The soldiers who had fought in the war had returned and they were given first choice. I changed universities three times in order to be fi nally accepted on the undergraduate and graduate programmes in chemistry. In the meantime I was forced to study biology because women weren’t accepted in the laboratory. Was it actually put to you like that: We don’t accept women? Wittmann Just like that. There were no set rules, but the professors simply didn’t want it. For them it was clear that a woman would simply quit after completing her degree. In Tübingen it was particularly diffi cult, but I still really wanted to go there. There was only one other female student, out of about 60 students. And she did in fact leave after getting her degree. When I announced that I wanted to go on to get my PhD, they claimed that I would never be able to get a job, certainly not in industry – in a library at best. Rosenbaum There weren’t that many women in my first semester either – five or maybe eight out of 120. But I’ve never heard of a situation like yours, Ms Wittmann. In my day it was more subtle. When I was in a maths class in school, for example, and I was the only one who knew the answer, the teacher once said, “You don’t want a girl to make fools of you, do you?” Later on I had an English teacher who was asking the class about what we wanted to study. When a boy said “Physics”, he said, “That’s a really exciting subject”, but when I said “Physics”, he asked, “Really? That’s very difficult! Wittmann But when you started studying, it was different, right? Rosenbaum When I began studying in Heidelberg in 2000, they were grateful for each individual starting the programme. The workgroup leaders were in competition over who could get the most students to join their laboratories. In this respect, I think that the professors were pleased when a woman showed interest in their subject. But I was never sure if it was just about keeping up with quotas set by politicians to get more women to study natural sciences. Rosenbaum We were able to choose our topics ourselves. All of the possible topics were listed on the university website, offered by the various laboratories. And of course, there were more topics than students. So, suddenly, you were there in a Munich laboratory, Ms Wittmann, and you were supposed to conduct research on the structure of adult haemoglobin, a large protein. What was that like? Wittmann There were no guidelines, no instructions. The only group doing research on this topic was in Prague. They were doing paper chromatography. But you couldn’t just go to Prague and interview them. So I showed my supervisor the Prague article and said, “This is how I want to do it.” He was against it at fi rst, but I didn’t give in. When Mr Butenandt came around, every two or three months, I always had everything prepared. But he just said that it was all very interesting but he couldn’t give me any advice because he hadn’t worked in that field before. I thought that was really honest of him. Rosenbaum My boss didn’t know much about my topic either, but he knew someone who knew someone that we could ask. And in the age of e-mail, lowcost telephone connections, and regular conferences, it was no problem to get in touch with the people. How did you go about getting advice from your colleagues in Prague, Ms Wittmann? Wittmann You couldn’t even write a letter. It would have been opened and the scientists there would have got into trouble. Later on, when one of the Prague students travelled to Paris, I was able to meet him. We were finally able to meet! With the aid of paper chromatography, you were able to separate peptides, that is, fragments of proteins. Does this method still exist? Wittmann Not at all! From a modern standpoint, that method was totally primitive: using a sewing machine to sew together one or two-dimensional strips of paper with the pre-separated peptides for subsequent separation onto paper. We had a kind of big tank in the chromatography room, which we had to patch it up once a week, because the gasket always slipped. Friday was patch-up day, to make sure we could suspend more chromatograms again the following week. Rosenbaum In biology I also made all my samples myself, doing the pipetting in particular. Of course, our equipment was not patched up so much, because today there are commercial suppliers for things like that. But I did put things together my- self a bit, with lots of tape and screws and stuff. That was actually the most fun part. Mr Butenandt came around every two or three months to see Ms Wittmann. Ms Rosenbaum, how often did you see your professor? Rosenbaum He had just been made professor and didn’t have very many students to advise at that time. I could just go into his office and ask him anything. But I didn’t have very much contact with the director of my institute. She knew my name, but that was about it. Wittmann Mr Butenandt organised a seminar once a week that we called “kiddies’ hour”. He specified a certain topic for the week, and we had to prepare for it. Then he would ask, “Honourable colleague, could you please stand up and draw that on the blackboard?” It was a bit like an examination. Rosenbaum There wasn’t anything like that during my PhD in Grenoble. But on the other hand, that’s the way it is now at the Max Delbrück Center, where I am now. Once a week someone presents the progress they’ve made in their studies. Wittmann But today that’s limited to the narrow field of one’s own research. Nobody is an all-rounder any more, knowing all about an entire field, be it biology, medicine or chemistry. Rosenbaum We also try to look beyond the end of our noses. We have another seminar where someone has to introduce a publication that is not directly related to our topic. It’s not exactly outside our field, though – it mostly deals with molecular biology, biochemistry or biophysics. How did you finance your PhD studies, Ms Wittmann? Wittmann Thankfully, I had a very understanding father. There were no scholarships at that time; I just got 100 deutschmarks per month in the final year of my PhD. The fact that my mother had also studied chemistry and finished her PhD in 1924 certainly helped. I was 29 by the time I completed my PhD. My parents helped me throughout that time, even though there were four of us kids. I was working as well, to make a little extra money. Wittmann What are you thinking? Women couldn’t do that! I worked for TOTO, checking lottery tickets. Row after row, number after number, using a template. In the evening I was ready for the funny farm. Rosenbaum For me, it was normal that we all had a PhD research position. In France, I had a grant from the Ministry of Research and a small teaching job at the university. It wasn’t a lot of money, but since I’d been on a student budget before that, it seemed a lot. Ms Rosenbaum, you went to France for your Master’s Degree. Is international study more important today than it used to be? Rosenbaum If you want to start a career in science, you have to go abroad early on. I find that dogma a little too extreme, though. Of course it’s important that the people change laboratories once in a while, but you could theoretically do that within Germany too. However, the reality is that if you apply somewhere and they see that you haven’t spent at least two or three years in a foreign country, you’re out of the race. 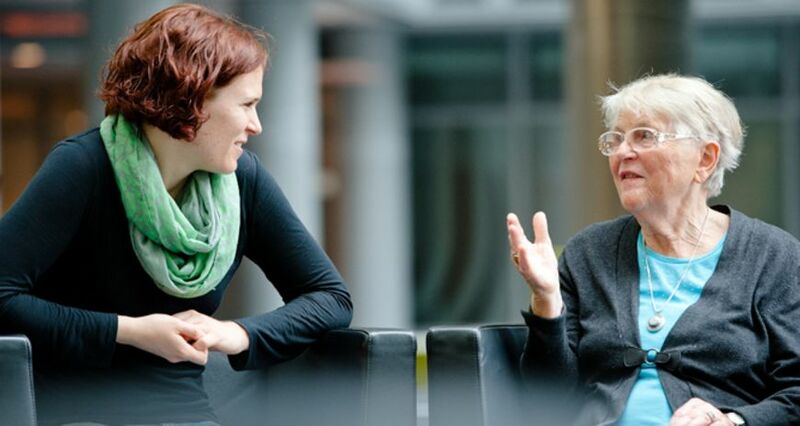 Ms Wittmann, before you moved to the Max Delbrück Center, you had been at the Max Planck Society for 30 years. Wittmann Yes, but I was lucky. When I was working as an assistant in Munich while I was doing my PhD, they made it clear to me that, as a woman, I didn’t have a chance to stay any longer than two years. Actually, I wanted to go to America, but in the end I got married and went to the institute where my husband was working. Was it typical at that time to be taken on at an institute where one’s husband was working? Wittmann Of course not. We met because we were working in the same field. My husband had been sent to Munich to learn our methods. I was the one who showed him everything about proteins. And then we just kept on working with one another. Was there any pressure for you to just stay at home? Wittmann No. I was even being paid for my work, which was important because I had children and needed my money for childcare. Later, our group leader was appointed to a professorship in Belgium and asked me if I would take on four of his doctoral students. I said, “I’ve got a small baby at home, how am I supposed to manage that?” In the end I did it anyway, and got the students through. But that was never the intention – I always had just a simple employee position, like a postdoc. Officially I was a group leader, but the salary didn’t reflect that. Rosenbaum A position as group leader is my next goal, too. Nowadays it’s not hard to find a postdoc position – there are so many of them. But they are all with limited contracts. And we’ve all got this contract law for scientists hanging over us that says we can’t have an indefinite period of employment for any longer than twelve years. Those individuals who haven’t been able to land a permanent position by then are out. What do you mean when you say “a permanent position”? Rosenbaum A professorship. There are almost no other permanent positions. According to the statistics, three percent of all PhD graduates get a professorship, and ten percent of postdocs. That means that we postdocs are faced with a 90 per- cent chance of things not working out. Wittmann In other countries, scientists are part of the institute or the university, and they have a permanent job there. Also, they are always allowed to change their assignments or move to new projects. Ms Rosenbaum, would you be satisfied with a group leader position? Or are people obsessed with continually climbing the ladder? Rosenbaum That’s just what I’ve been asking myself lately. I really like working in the laboratory. My boss, on the other hand, is almost always busy with fundraising and evaluating the publications of other people. I’ve never seen him actually pick up a pipette. Many scientists complain about the pressure to publish. Did this problem already exist back in your day, Ms Wittmann? Wittmann Back then things were just getting going with the English-language journals. But our bosses still wanted to publish in German. They wanted everything to go back to how it was. That was something us young folks found easier. But what we didn’t have back then, thank goodness, was this scaling system – the idea that there are so many points for one journal and fewer for another. Rosenbaum That’s just what I find so frustrating – the fact that it doesn’t matter how good your research is but rather where it’s published. That is then seen as the only measure of quality. And if someone wants to publish something that goes against scientific doctrine, they won’t get into the best-regarded journals. The irony is that it’s only ten years later that you can tell whether something was revolutionary or not. Let’s talk about the topic of how to combine family and a career. Do you think anything has changed in that regard, Ms Rosenbaum? Rosenbaum It’s difficult enough for a single person to get to stay in the same city. I know a lot of couples in my circle of friends who have to maintain a long-distance relationship. That brings me back to the fixed-term contract law, which represents a huge obstacle for us women. You can get one extra year per child, but the time most women want to start a family is precisely the period of time when we have to be the most productive if we want to achieve anything within this system. Wittmann I think the main difference today is that women have really good opportunities – as long as they’re willing to defer having kids. You have too many responsibilities, you’ve got to travel to conventions, work nights in the laboratory – and on Saturdays and Sundays. That’s very difficult to manage if you have small children. Rosenbaum Men manage it. If we were to turn those traditional roles around then just maybe it would work.